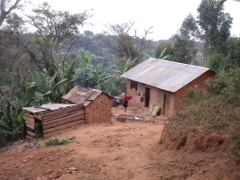 The Pare is another tribe located in the Kilimanjaro Region, predominately to the east of Moshi, in and around the beautiful Pare Mountains. This tribe consists largely of farmers, still using traditional methods and farming by hand. There are many interesting stories about their past traditions and they are well known for their knowldege of herbal medicines. You will learn about their native religion (no longer widely practiced) and visit their places of sacrifice. The Pare Mountains are a great location for hiking and seeing the Tanzania unknown to most tourists, located very near to Tanzania's newest national park, Mkomazi.The Pare is another tribe located in the Kilimanjaro Region, predominately to the east of Moshi, in and around the beautiful Pare Mountains. This tribe consists largely of farmers, still using traditional methods and farming by hand. There are many interesting stories about their past traditions and they are well known for their knowldege of herbal medicines. You will learn about their native religion (no longer widely practiced) and visit their places of sacrifice. The Pare Mountains are a great location for hiking and seeing the Tanzania unknown to most tourists, located very near to Tanzania's newest national park, Mkomazi.